Revisions or MBs | Does This Font Make Me Look Fat? On Saturday Laura and I attended an Eastern Shore Writers Association meeting. 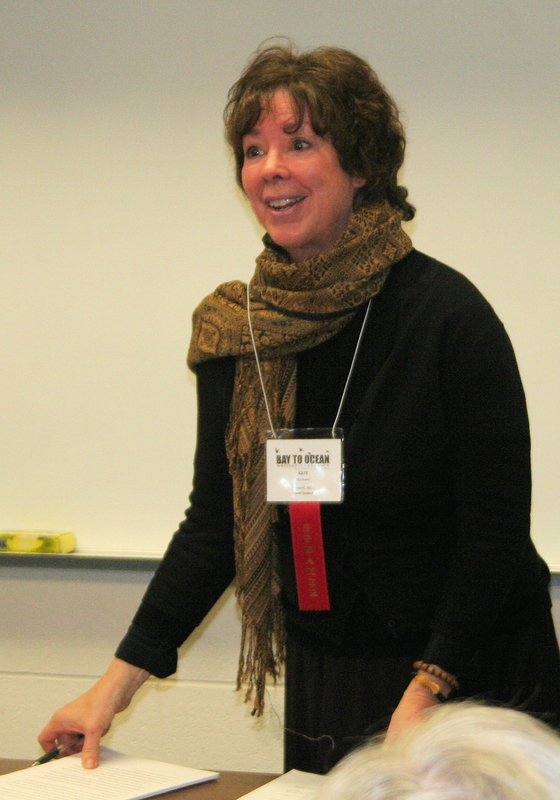 The guest speaker was Kate Blackwell, a well known author who teaches at the Writer’s Center in Bethesda. Her topic was revision. Kate is a dynamic speaker whose personal style resonates. Known for her short stories (You Won’t Remember This: Stories), Kate shared she is currently working on a novel. She said she had a main character when she started but didn’t know how the story arc would proceed. She had to just start writing. When I write, I start with an outline. The plot doesn’t always adhere to my preliminary vision, but I can rework the outline as I go along. Sometimes my characters have taken turns that I didn’t forsee, but I’ve learned that those characters have minds of their own and need to be heeded. Occasionally a character just shows up, so perhaps my process is not so different from Kates. When Laura and I write we start with a story arc outlined on a huge piece of paper. We want to know the story arc highlights and fill in what we think will happen at those pivotal points. This tool has been used by us for novels, movie and TV scripts, and now a play in development. Some people revise what they’ve written the day before and only then move on. I try not to do too much of that or I get bogged down. I can spend two hours reworking what I wrote the day before, and not get to the new part. In talking about revision Kate indicated that you have to be willing to discard pieces of the story that you like if they don’t move the action, or move it in a way that will create problems later in the story. That’s hard, but necessary. The bottom line seemed to be that we all write in different ways, using different tools, and revision is idiosyncratic as well. I don’t remember who said it, but the notion that you have to get something on paper before you can fix it, has stayed with me. I occasionally have dialogue that says, “Blah, blah, blah” because I just don’t know what a character should be saying. But I might know what happens next so I keep going. When Laura and I read what we have written and begin the revision process there are always a lot of MBs in the margins. For us that notation means “Make Better.” And sometimes MB means starting all over again. Don’t you just hate that!